The Caribou Lodge is located on a remote lake above timberline in the Talkeetna Mountains just southeast of Denali National Park and is closer to Mt. McKinley than the park headquarters or entrance. Nature and tranquility are our only neighbors. The location is our home year around and a private paradise in the Alaskan wilderness or “The Bush,” as it is known to Alaskans. 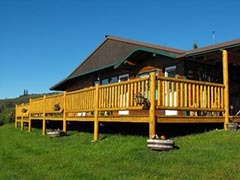 The lodge offers fantastic views of Mt. McKinley and the Alaskan Range to the west and to the east overlooking the lake, stands the beautiful Talkeetna Mountains. Wildlife is generally good in the area. Caribou, moose, grizzly bears, sheep, black bears, wolves, coyotes, fox, wolverine, ermine, otters, eagles, short-eared owls, ptarmigan, ducks, loons, Canadian geese, and swans have all been observed from the comfort of the lodge and the cabins. Wildflowers abound mid July through August. The many berries come ripe in July. The long days of summer bring awesome sunrises and the tranquility of the Midnight Sun as it slips behind Denali is a sight to behold. The aroma from the kitchen will make your mouth water. Hearty Alaskan meals are served family-style in the lodge. Sourdough pancakes and biscuits top your breakfast plate. Homemade jellies, breads, soups, pies, and pastries are just some of the delicious treats that you’ll experience. 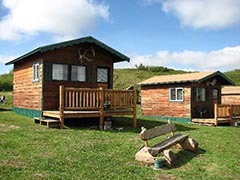 A small and personal operation without the crowds, Caribou Lodge offers a relaxed learning experience with an Alaskan wilderness family. We have 20 years living in The Bush, we know the country and wildlife well and enjoy sharing it with a limited number of guests. “Live like a local”, with locals! Come join us! Your cabin is cozy and comfortable. A centrally located shower house is available along with a sauna for you pleasure. We generally limit the number of guests to ensure you have a private personalized stay. The aroma from the kitchen will make your mouth water. Hearty Alaskan meals are served family-style in the lodge. Sourdough pancakes and biscuits top your breakfast plate. Homemade jellies, breads, soups, pies, and pastries are just some of the delicious treats that you'll experience. Recreation activities are limited only by your imagination and the seasons. You can view wildlife, observe the flora and fauna, ply you lens in unlimited photography opportunities, or take a leisurely boat ride around the lake and try your hand at catch and release fishing. In season fields of wildflowers and mouthwatering berries will delight your eyes and tantalize your taste buds. You can take one of the many hiking options, from the short hike to Bear Point for a 360degree panoramic view of Mt. McKinley, the Alaskan Range, the valley below, the Talkeetna Mountains and to the North as far as the eye can see. Or you can hike to one of the nearby lakes, streams, and beaver ponds, for observing the wildlife, trying your hand at gold panning, a little fishing, or just enjoying the cool, clear mountain waters and basking in the scenery around you. For the more adventuresome we offer several excellent guided lodge/backpacking combinations, ranging from a short 3-day lake and stream hike for the easy traveler to a 5-day fly-in to a high mountain glacier lake and pack back to the lodge. For the hearty mountaineers we offer an 8-day excursion over the mountains to the foot of the glacier and a loop route back to the lodge--all through some of the most scenic areas Alaska has to offer. Please contact us for detailed itineraries. In summer, access is available by floatplane only, which operates daily from Anchorage, Wasilla, Willow, and Talkeetna. Scenic flights to Mt. 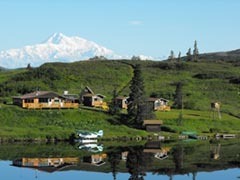 McKinley and the area are also options for your flight to the lodge or during your stay. Depending on the number of people, location of departure, and scenic flight option, we will quote your price to your desires. A sample: from Talkeetna, rates will range from $100 to $180 per person round trip. Minimum two passengers.